The inaugural light show has taken place on what is described as the “the world’s first connected bridge”. 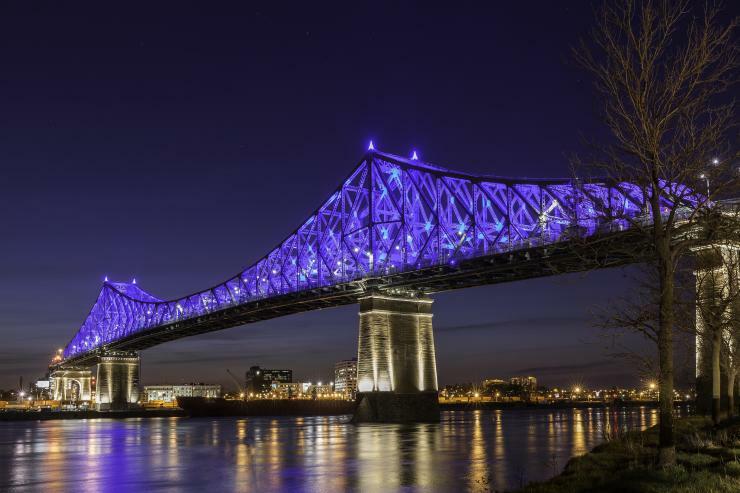 Jacques Cartier Bridge has been fitted with an interactive lighting work, Living Connections, as part of the official program for Montreal’s 375th anniversary and Canada’s 150th. After the 30-minute show marking the official launch of Living Connections, the bridge began its regular daily programming. The bridge awakens at sunset and goes to sleep with the day’s first light, featuring programming that adapts to the seasons and the city’s “energy”. The intensity, speed and density of sparkles of light change depending on how often Montreal is mentioned on Twitter. Every new tweet sent with Montreal-related hashtags, including #IlluminationMtl, #375MTL, #Montréal, #Mtl and #Mtlmoments, is captured by the bridge’s illumination system. The tweet is then transformed into a moving sparkle of light in the colour of the day. If the tweet is liked, the moving light expands. If it is retweeted, it accelerates. Otherwise, the moving glimmer of light disappears after a few moments. As the seasons change, so do the lights. The bridge changes with the seasons using a 365-colour calendar. Day after day, the heart of the bridge gradually shifts from a lively spring green to a radiant summer orange, a rich fall red, and finally an icy winter blue. As its colours change gently with the seasons, the bridge’s lights subtly mark the passage of time. A reflection of Montreal’s energy. Every hour at night, a series of 5-minute animated lighting sequences visually translate Montreal’s energy based on different types of daily data: the weather, traffic, news, major events, and more. The bridge is then taken over by luminous movement, coloured according to the hottest topic of the day in Montreal media: society (red), environment (green), technology (light blue), business (grey), sports (blue), institutions (pink), culture (purple). At midnight, the cycles through all 365 colours on its calendar, looking for the colour of the day. At the end of the night, the bridge’s framework goes dark. Only the turrets reaching high into the sky and the piers supporting the structure remain softly lit. Finally, at dawn, the bridge greets the city’s early risers. It is subtly illuminated with lights mimicking the colour of the sky in real time. The Living Connections project is managed by Jacques Cartier & Champlain Bridges Incorporated. Moment Factory is responsible for the concept, in collaboration with six Montreal-based lighting and multimedia studios: Ambiances Design Productions, Atomic3, Éclairage Public / Ombrages, Lucion Média, Réalisations and UDO Design. The engineers for the project are the WSP-Aecom consortium, and lighting systems were installed by Pomerleau.